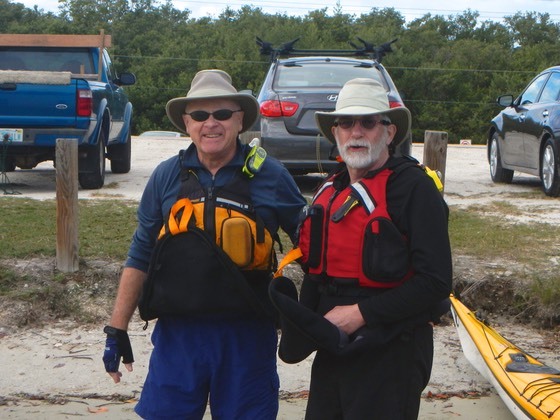 Each year since I moved to Florida, my buddy Bruce has made the trek from the cold of upstate New York to Sunny Florida for some winter paddling. Sometimes it’s just the two of us as in 2011 (Paddling the Indian River Lagoon) and 2012 (Day paddles from Cedar Key). Sometimes we can corral a bunch of our other paddling friends for a group adventure as in 2013 (Paddling Florida’s 10,000 Islands) and 2014 (Paddling in the Everglades). This year it was the two of us again, with our friend Alan going us for part of the trip. We based ourselves in a condo in Naples on Florida’s southwest coast. Access to the condo was granted to us through the generosity of Bruce’s father-in-law who was not using it at the time. Our plan was to do day trips from that location, with Alan joining us for two or three days at the end of the week when he was not working. 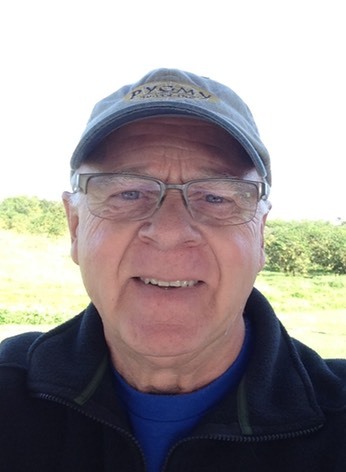 Alan has a “retirement job” (an oxymoron?) in Fort Meyers where he lives. I arrived at the condo around dinner time on Sunday. We went to dinner, then immediately got out our maps and paddling books to plan our week. Monday was badly overcast with rain predicted, so we decided to check out the list of potential launch points we had identified. One of our first destinations was Naples Kayak, where my friend Paul Westberry works as a guide. Our objective was to set up assisted and self rescue training for ourselves as we had not practiced this in several years. We scheduled a training session for Thursday morning, then went about evaluating the launch sites. We would begin with a paddle I had attempted twice before; the Halfway Creek/Lefthand Turner River Loop from Chokoloskee Island, south of Everglades City. I was really looking forward to this paddle. As I mentioned, I had tried to do this trip twice before, the first time in January of 2006. However, the Halfway Creek/Lefthand Turner River route was closed then because the twin hurricanes of 2005 had blocked passage with debris. 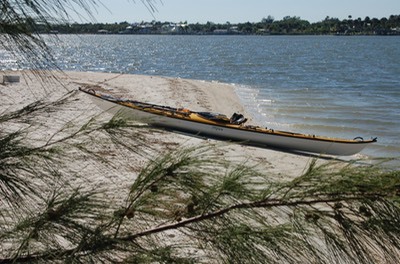 So that year we paddled the Turner from Route 41, the Tamiami Trail to Chokoloskee Bay. (Click here to see that report) The second time was two years ago. Alan and I had an extra day to paddle after our 10,000 Island Trip paddling buddies had departed for the North. Using a woefully inadequate, not to scale drawing of the route, we paddled into the Lopez River instead of the Turner and got terribly lost and confused (click here for that report). This time with good maps and using the correct route would be different. 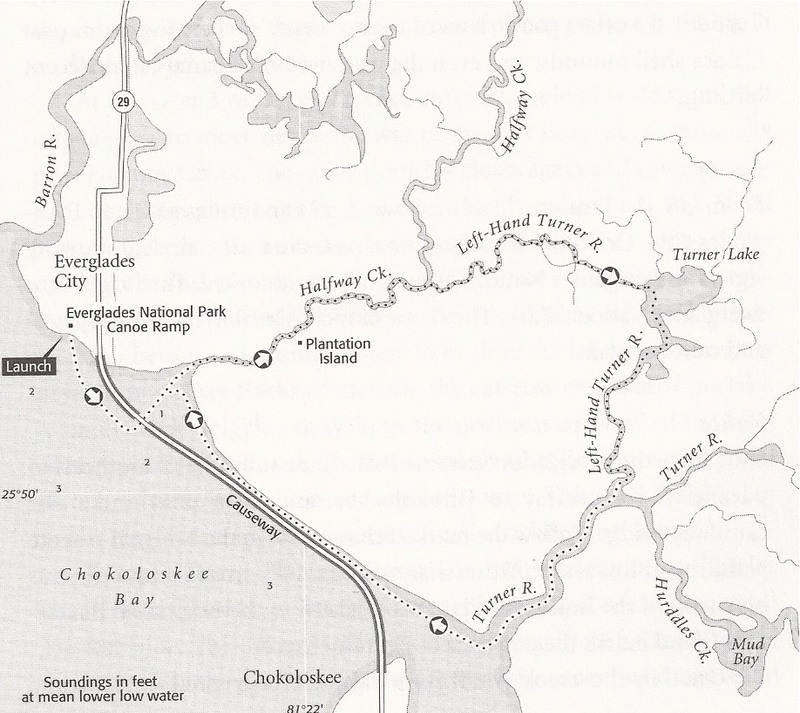 This guide book recommends that you start the trip at the mouth of Halfway Creek. There are good reasons for this. First, the entrance to Halfway Creek is directly across from the Chokoloskee Causeway bridge and, unlike the entrance to the Turner River, is easy to spot. Had Alan and I gone this way rather than trying to find the Turner first, we wouldn’t have gotten lost. Second, it is very easy to miss the entrance to the left branch of the Turner from the Turner River. It’s much easier to find it from Halfway Creek. 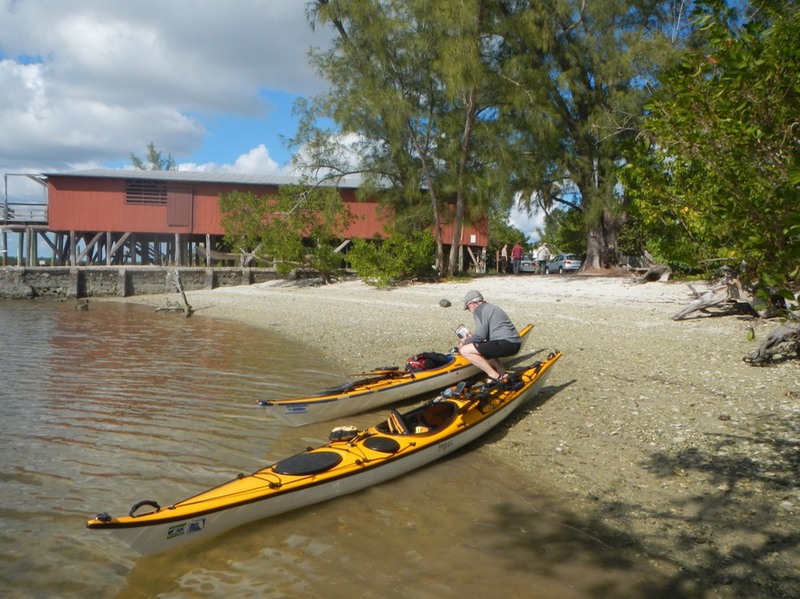 We launched from the beach at Ted Smallwood’s Store rather than from the Everglades National Park canoe launch. Smallwood’s Store is now more of a museum than an actual store. 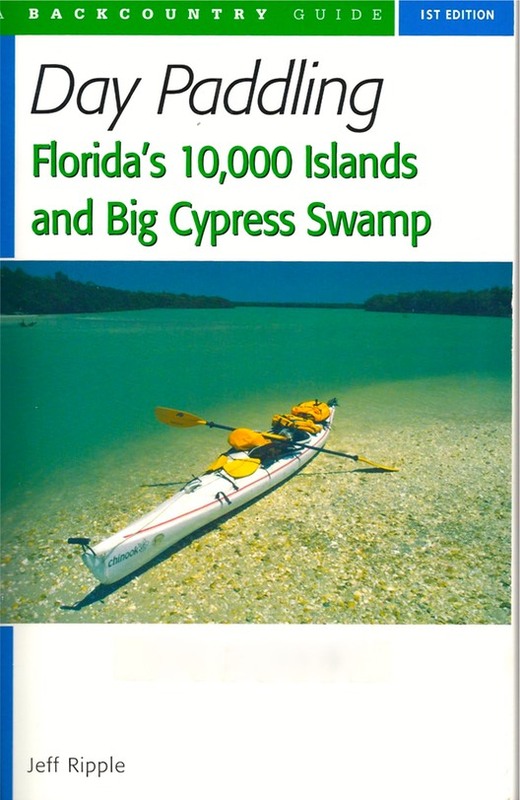 It is on the National Register of Historic Places and is central to much of Chokoloskee and South Florida history (See my reports on the books, “Killing Mister Watson” and “Touch, A Life in the Everglades” for a dose of this history.) The store is now supported by a not-for-profit corporation. It cost us ten bucks to park and launch there, but we were glad to pay the price to support this organization. Many of the early settlers on Chokoloskee Island moved to farms up Halfway Creek. The northern side of the lower creek is not in the national park, so there are still homes and commercial ventures along this lower stretch. 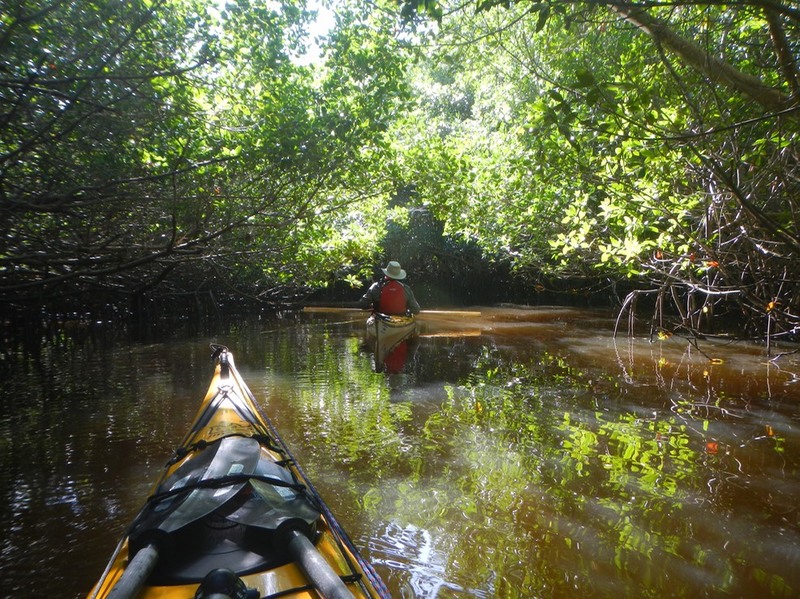 But in a short time, we were paddling through what we had come for, the mangrove tunnels. As the photo above shows, these tunnels are more open than those on the upper Turner River (Click here to see the 2006 report). On the upper Turner, the tunnels were so tight that we had to break our paddles in half and paddle our kayaks like canoes. When even that became impossible, we simply pulled ourselves through using the branches overhead for hand holds. On this route, the creek/river was two or three paddle lengths wide in most places, with lots of room overhead and a noticeable lack of snags. We learned that this route was kept open by the National Park Service. This was to accommodate powerboat tours from the Park. We ran into one in one of the tunnels. This video gives a good idea of what its like to paddle this route. But be warned, the video is five minutes long. We finally reached the broad Turner River and paddled west toward Chokoloskee Bay through a tangle of oyster beds and mangrove islands that confirmed my suspicion that the Turner is difficult to find from the Bay. We took our time on this trip taking some five hours to cover 10.35 miles. But don’t expect to spend time ashore on this trip. There is virtually no place to get out of your boat. We spent the five hours of this trip in our boats. We arrived back at Smallwood’s Store, mid-afternoon, in time for a cold coke and a shower at home before dinner. We really enjoyed this day trip and would recommend it.